La Colombe Torrefaction is a world-renowned Philadelphia- based coffee-roasting company. I discovered La Colombe while I was spending a weekend in Philly. Right around the corner from the Rittenhouse Square, we happened to walk by this tiny, packed with Sunday morning clientèle coffee house with the amazing smell of fresh brewed coffee. Since then I simply couldn't drink any other type of coffee without having to compared it to the coffee from La Colombe. Thankfully La Colombe had an online store so I could order pound-bags of beans every so often. Then the unimaginable happened. 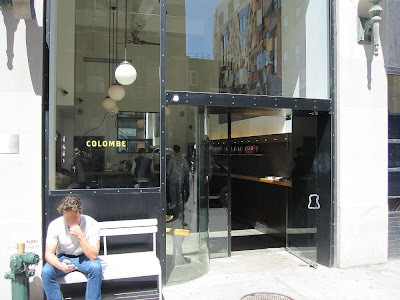 La Colombe decided to open their own little coffee shop among the other hundreds of coffee shops in NYC. I believe now they have three locations in Manhattan which makes it very convenient to stop by to get my cappuccino or espresso fix and at the same time replenish the coffee beans for home use. I try to make one or two trips a month here to sit down to have a nice cup of cappuccino with a fresh chocolate croissant while I restock the bean bags. If you are interested in coffee beans, they offer five main types; Corsica, Phocea, Nizza, Beaulieu and the Monte Carlo. They also had one limited edition called the Afrique which has some spicy tones to it. La Colombe on Lafayette Street is pretty tiny. On the right hand side there is a counter so you can stand and have your coffee. On the left hand side there is a long bench, built in to the wall with small tables and stools. Besides the usual coffee, espresso, cappuccino, latte, hot-chocolate, etc. they also serve a small selection of fresh pastries but that's all you are going to get here. Their focus is coffee and coffee only - no fancy coffee codes. If you are used to a Starbucks type of a coffee store this is not the place for you. There isn't a menu on the wall, no fridges with juices, sandwiches or fruit cups. 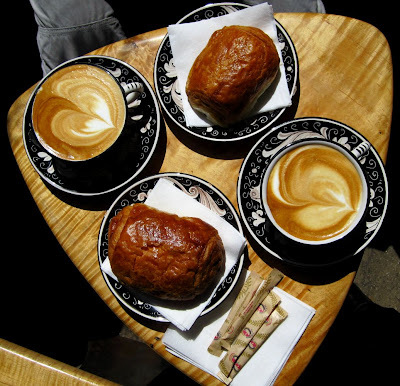 Here you will find coffee aficionados having their fix with their morning newspaper and a pastry.